The U.S. economy grew at a 2.4% annual pace in the fourth quarter, marking a slowdown primarily driven by cuts in government spending. The economy merely muddled along at the end of the year, but economists call it "impressive" given the federal spending cuts and the government shutdown in October. Overall, economic growth was not quite as strong at the end of 2013 as originally thought, according to revised data released by the Commerce Department on Friday. Gross domestic product -- the broadest measure of economic activity -- grew at a 2.4% annual pace in the fourth quarter, revised down from 3.2% originally reported last month. 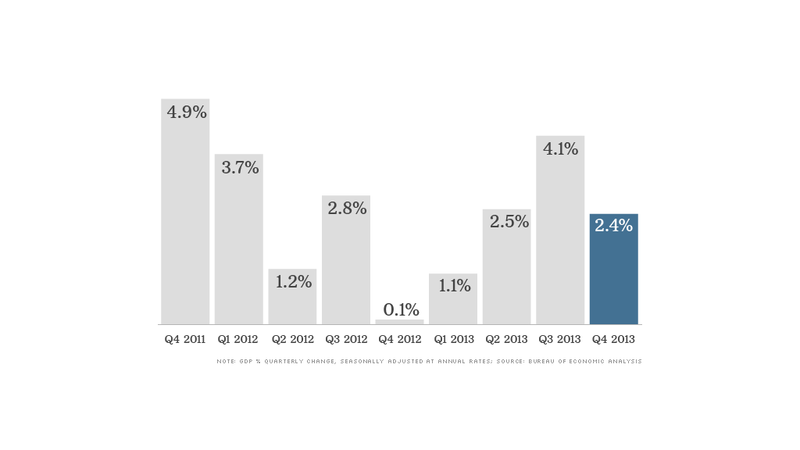 The number fell short of economists' expectations and is disappointing after faster 4.1% growth in the prior quarter. Given that drag, overall economic growth is "still impressive," Paul Ashworth, chief U.S. economist for Capital Economics said. Weakness in the housing sector also weighed on the economy. Investment in residential real estate slowed for the first time in three years, according to the report. As usual, the U.S. economy is still driven primarily by consumer spending, which picked up slightly in the fourth quarter. International trade was also a large driver of economic growth, as exports grew at a faster clip than imports from other countries. Business investment contributed to growth, albeit at a slower pace than in the previous quarter.